This is my favorite day every month. I learn something new about these fabulous women each time! Today we talk to April Jean and I know you’ll enjoy her answers as much as I did! G&S: You have a couple of great nicknames. Care to share? AJ: Hankuna Matata (last name used to be Tatta) & Ape! G&S Who are your immediate family members? G&S Where do you and Eric currently call home? G&S: I know you haven’t always lived here. Where else have you called home? G&S: Besides your job, what takes up most of your time? AJ: Thinking about my next meal! “What will I eat?” “What can I make?” “Will this go well with that?” “How soon can I eat?” Besides that, relationships are my hobby. And I like (need) my alone time. G&S: You do really well with that relationship thing. 🙂 So what are you reading right now? G&S: Oh, I like her! What about some of your all time favorite books? AJ: “So Long Insecurity” by Beth Moore and “The List: Figuring out Prince Charming, the Corner Office & Happily Ever After” by Marian Jordan. G&S: How about a few of your favorite TV shows? And Netflix counts. G&S: Which is your favorite YouTube vlog snack? Sweet or salty? AJ: SALTY, the more garlic and cheese the better. But give me something sweet afterwards too! G&S: What is your favorite holiday? G&S: I suppose that’s better than starting it in July. 🙂 What is your favorite scripture and why? AJ: Oh, it’s my boy Moses! Specifically, Moses with the burning bush. I just relate to his fear, doubt and insecurity tremendously… and love seeing his obedience regardless and God’s faithfulness in that process. Exodus 3:1-4:17 Please read for a refresher people! G&S: I’m going to have to go read that again! 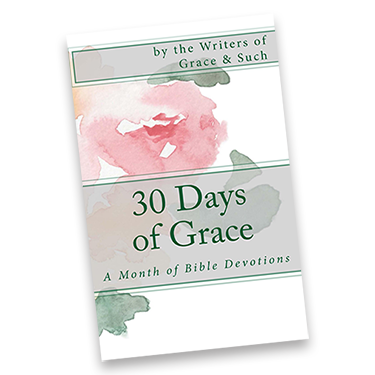 And last, but not least, why do you write for Grace & Such? AJ: It’s a great opportunity to practice writing and encourage others while doing it! G&S: Wonderful! Thanks for playing along, April. It’s nice for us to get to know you a little bit better. And thanks for sharing your wisdom and encouragement with us every month!